Veteran British actor Michael Gambon, best known for portraying Professor Dumbledore in six of the eight Harry Potter films, is retiring from the stage due to memory issues. "It's a horrible thing to admit, but I can't do it," the actor, 74, told London's Sunday Times magazine. "It breaks my heart. It's when the script's in front of me and it takes forever to learn. It's frightening. "In the candid interview, the Dublin-born star, who grew up in North London, revealed that he had struggled to remember his lines after reading for a new West End play six months ago. "There was a girl in the wings and I had to plug in my ear so she could read me the lines," he said. "After about an hour I thought, 'This can't work. You can't be in theater, free on the stage, shouting and screaming and running around with someone reading to you.' " A member of Laurence Olivier's National Theatre acting company and a four-time BAFTA winner – Britain's version of the Academy Awards – Gambon achieved worldwide fame when he assumed the role of kindly Hogwarts headmaster Albus Dumbledore in 2004, following the death of Richard Harris, who originated the part. At the recent Celebration of Harry Potter event held at Universal Studios Orlando, Gambon joined his fellow costars Evanna Lynch and James and Oliver Phelps for a brief Q&A. Asked about the response to his upcoming role in BBC One's The Casual Vacancy, which is based on Potter author J.K. Rowling's 2012 novel of the same name, he said he'd received positive feedback from the superstar scribe. "She wrote me a letter when we finished [filming], congratulating me on the performance," he said. 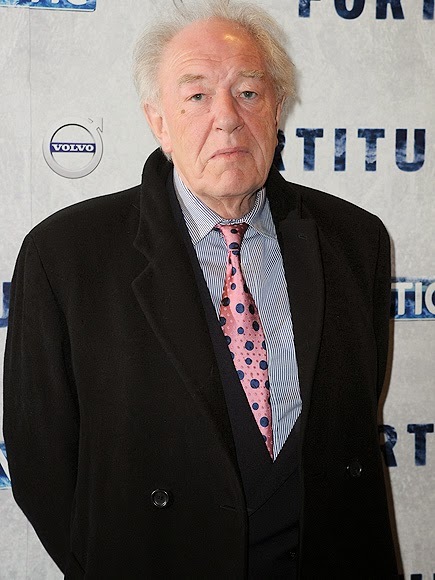 Gambon, who appears in the theme park's Harry Potter and the Forbidden Journey attraction, also joked about avoiding the popular thrill ride. "I rode it years ago and nearly died!" he said. "Dan [Radcliffe] was skating next to me and I was so frightened I kept my eyes shut. I looked over at Dan and he was grinning wildly. I would love to go on it but I'm too old."